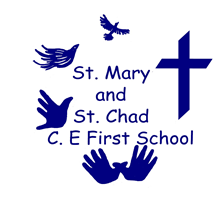 As a Church school, St. Mary and St Chad CE(VC) First School has a Christian ethos, reflected in its aims and objectives for every child and adult working within the school. All aspects of the school’s daily routine are planned with these aims in mind. Daily morning worship is held, and provide an important means of reinforcing the Christian values of the school. Close links are also enjoyed with local churches where the school’s progress is followed with interest by the Church members. The children visit St. Mary and St Chad church for services during the year. The aims of the school go beyond the undoubted importance of high academic achievement within the child’s capabilities, and job satisfaction of each adult. Children and adults alike are encouraged to value, respect and care for each person as an individual and the contribution that they make to the life of the school. Working together, hand in hand we will support and encourage each other to try hard and do our very best and fly high. The Christian faith and values underpin and integrate through all that we do. Those who trust in the Lord will find new strength. They will soar high on wings like eagles.